1-year PG Diploma in Clinical Echocardiography, offered by JROP Institute of Echocardiography, U/S and Vascular Doppler, New Delhi. Affiliated to Annamalai University, Tamil Nadu. Click here for more details, application process. Venue: JROP Institute of Echocardiography, U/S & Vascular Doppler C‐1/16 , Ashok Vihar, Phase‐II, New Delhi‐ 110052. 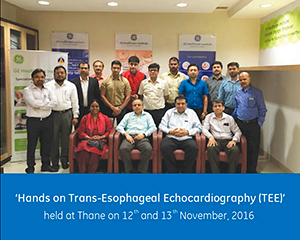 Conducted by GE Healthcare Institute, in collaboration with the Indian Academy of Echocardiography. The program is supported by an unrestricted research grant from Sun Pharmaceuticals. Workshops conducted every month at the GE Learning Centre, Jupiter Hospital, Thane. From time-to-time offsite workshops are also conducted. Highly experienced faculty members from IAE conduct these workshops. The program is widely appreciated by the participants. The hands-on training using the state-of-the-art simulator provides a unique learning experience. Most participants gain immense understanding of TEE views and confidence in performing TEE by the end of the workshop. Click here for program calendar and contact details.